They are super lightweight with stable hinges and a comfortable fit around the ear. The lenses are happily clear and polarized, helping to better define the horizon and distant figures in an expansive landscape. The pink lens is bright but not too disruptive. 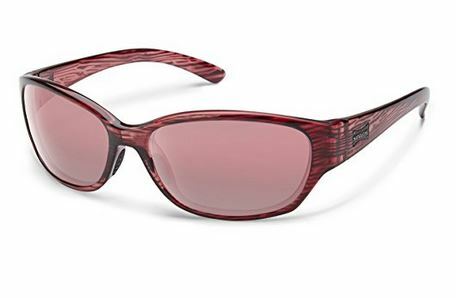 A subtle wood-grain design akin to tiger stripe adds a little flair to the translucent rosy frame. Along with the glasses came a satiny storage pouch in the same color with a smooth black flat ribbon cinch, all delivered inside the minimal clear plastic zipper bag packaging. super lightweight with stable hinges and a comfortable fit around the ear. The lenses are happily clear and polarized, helping to better define the horizon and distant figures in an expansive landscape. The pink lens is bright but not too disruptive. A subtle wood-grain design akin to tiger stripe adds a little flair to the translucent rosy frame. Along with the glasses came a satiny storage pouch in the same color with a smooth black flat ribbon cinch, all delivered inside the minimal clear plastic zipper bag packaging.